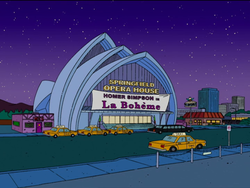 The Springfield Opera House is an opera house in Springfield, owned by Mr. Burns. Boris Csupovski performs there. This section is transcluded from The Simpsons: Tapped Out theaters. To edit it, please edit the transcluded page. Modified on February 17, 2017, at 22:00.